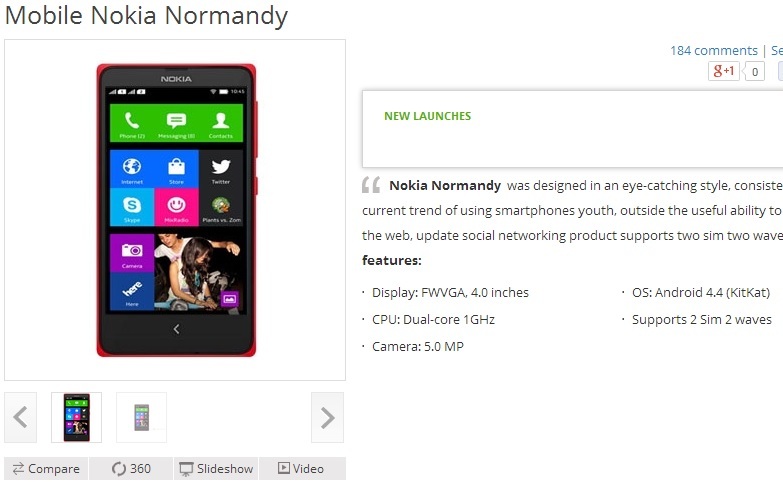 Nokia Normandy rumors are up again. This its more powerful and more obvious. Largest online retailer in Vietnam, The gioididong.com, has posted a listing for the Nokia Normandy. The listing shows an official picture with Nokia's proprietary Android skin we've already seen several times. The specs once again get confirmed too - a 4" WVGA display, a dual-core 1GHz processor (Snapdragon 200 chipset), 512MB RAM, Adreno 302 GPU, a 5MP rear camera with 720p video recording, dual-SIM capabilities and Android 4.4 KitKat. The design is similar to Nokia Asha phones. But there is no price or release date is mentioned on the site. The retailer also claims the phone will support all Google services including Google Now, Google Play Store and YouTube. In the meantime Eveleaks has given us new information regarding Android running Nokia again. They claim the phone's official name will be Nokia X.